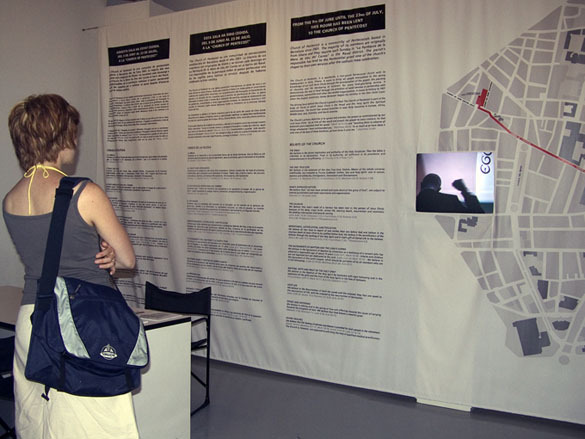 2005 – Ephemeral installation of variable size shaped by a vinyl canvas of 800×300 cm printed digitally with information texts and a map that relates the exhibition space and the real action space of the event, a video documentary, a table with chairs and photocopies to be taken away. In 2002 I participated in the exhibition Heart of Darkness. In my project, entitled Personalised attention Unit four participants offered a public service. 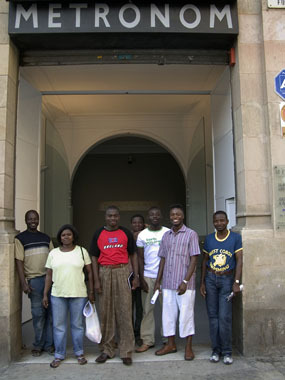 One participant, Wiliams Asante Kofi, is a member of the African Pentecostal Evangelic Church of Barcelona which celebrates services every Sunday in one of the chapels of Església de la Parròquia Mare de Déu del Carme in the district of Raval in Barcelona. The priest in charge of the church gives up the space at the end of the celebration of the Catholic rites. A little while ago they invited me to attend one of their services, obviously I was not converted, but it occurred to me that, this might make an interesting reflection in the context of the general proposal of the exhibition Body snatches in which I was invited to participate. In the Branch Project I handed over, for the duration of the exhibition, the space of the Africa Room of Metronom to the Esglèsia Evangèlica Pentecostal Africana of Barcelona, so that the members of the congregation, a new denomination in the city and basically comprising people from Ghana, the Ivory Coast and Nigeria, could find a platform of communication with a new and wider audience, with the possibility (and why not?) of attracting new members or collaborators. My intervention, apart from the project management and coordinating with the congregation, consisted of designing and organising the room for their use, the production of a promotional video, and the production of a flyer to publicise their activity in Barcelona during the exhibition. All these related elements shaped the installation. 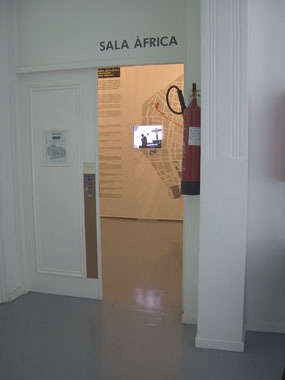 Sala Metrònom in Barcelona, in the context of the exhibition Body snatches , organized by the collective 22A and curated by Àlex Mitrani and Eduard Perez Soler.